The Delta - Latest News - Alcohol in Recruitment - Why Not? 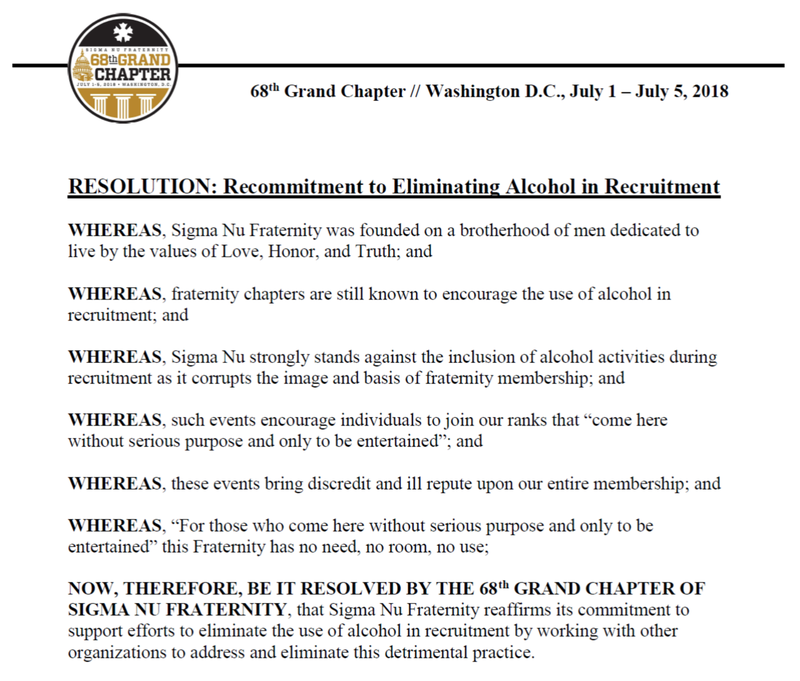 - Sigma Nu Fraternity, Inc.
At the 68th Grand Chapter held this summer in Washington, D.C. the delegates unanimously adopted a resolution reaffirming Sigma Nu’s longstanding commitment to prohibiting the presence or use of alcohol at fraternity recruitment events and activities. Moreover, there are three specific reasons chapters, and national fraternities, embrace an alcohol-free recruitment approach. Selling one experience then delivering an entirely different experience never works out well. When a person joins the fraternity because he enjoyed the recruitment party where he was provided free alcohol and sold on all the “fun” he will enjoy if he joins, his chief interest will be in participating in the chapter’s various social functions. Unfortunately, he is unlikely to be interested in the other components of a true fraternity experience such as attending chapter meetings, learning about financial responsibility, supporting chapter philanthropic and community service efforts, or serving on a chapter committee. What are you selling in recruitment? If your pitch doesn’t involve selling the full fraternity experience, then you should expect the recruits to be apathetic in most areas except the social side. Is that a membership base you can rely upon in the long-term? Research shows that a significant number of incoming freshmen elect not to engage in alcohol use. Based on 2017-2018 Survey 1 data from GreekLifeEdu, which had a sample size of 3,203 Sigma Nu members, 37% of respondents labeled themselves as “abstainers” or “non-drinkers.” Abstainers were defined as individuals who have not consumed alcohol in the past year and non-drinkers were defined as individuals who have not had an alcoholic drink in the two weeks immediately prior to taking the survey but have consumed alcohol in the past year. 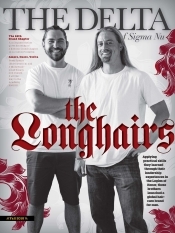 Students already know that social fraternities are social. The media and pop culture have done an effective job of painting that picture. Remember – we’re recruiting for a fraternity, not a social club. Relying on alcohol in recruitment will prevent your chapter from consistently recruiting quality new members. Alcohol is a crutch that enables a poor chapter to get numbers when their membership is unwilling or unable to put forth the hard work required to recruit a quality new member class. The chapter may get a large number of recruits, but low-retention and member apathy will plague the chapter and negate any positive momentum generated by recruiting an initially large candidate class. Do the work necessary to engage in values-based recruitment without the use of a crutch like alcohol. A fraternity committed to “Excelling with Honor” must be committed to finding and recruiting men who share that commitment. These men aren’t interested in investing their time and money in a purely social experience. 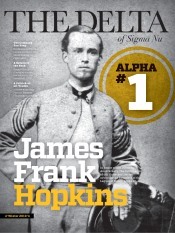 Your chapter offers much more than that; now show them that is the case in your recruitment. A bevy of recruitment-related resources are available on our website. Check out http://www.sigmanu.org/collegiate-members/values-based-recruitment to learn more about how to design an effective, alcohol-free recruitment plan.